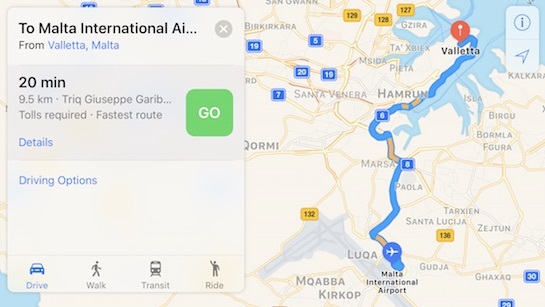 Apple Maps has recently been updated with all-new traffic data in Liechtenstein, Malta, Monaco, and San Marino, providing users with real-time updates about vehicular traffic in four more European countries. As usual, highly congested areas will have orange or red lines along the roads to indicate that drivers may face delays. Apple Maps traffic data is available in over 30 other countries, including the United States, United Kingdom, Canada, China, Singapore, Australia, New Zealand, Mexico, South Africa, Spain, Belgium, Germany, Greece, France, Italy, the Netherlands, Czech Republic, Denmark, Poland, Switzerland, and other European countries. Meanwhile, Apple Maps transit directions are now available in São Paulo, Brazil. I find iOS 10 to be a huge improvement. Shows a lot of traffic info while driving. But the algorithm is bad: Apple maps definitely does not show the fastest route. Waze is easily 20% faster to reach a destination as Apple does not seem to know all the shortcuts or reroute frequently. Now, that's a matter of philosophy. I abandoned Waze because it re-routed continuously. I like to know where I'm going, and I don't care if I miss the best route by 2 minutes. Waze was constantly telling me to pull off main roads into side streets with very little warning that it was changing on me. I agree if there is an accident or construction, but this is literally to save 1 minute overall. I hate back-seat drivers barking orders at me-- it's disconcerting and dangerous.